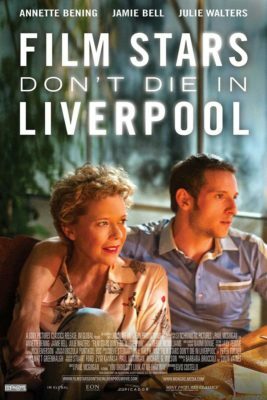 Film Stars Don’t Die in Liverpool comes from the Scottish filmmaker, Paul McGuigan and explores the relationship between the aging actress Gloria Grahame and young aspiring actor, Peter Turner. The film starts after the end of the two actors’ relationship, with Gloria reappearing in Peter’s life with an illness thats severity is unknown. This film provided a well balance of comedic relief while also tugging at the audience’s heart strings. The film travels back and forth through time, transitioning seamlessly through Gloria and Peter’s relationship. Presently Gloria and Peter are in Liverpool, where Peter’s family has offered to take care of the recently ill Gloria. During the flashbacks, Gloria and Peter travel to many places including London, California, and New York City and their love becomes stronger with every moment. Near the end of the film, it is revealed why their relationship actually ended and Gloria only came to Peter in the opening of the film for help because she didn’t want to worry her own family. This film was a true story on Gloria and Peter’s love, and is one to see for those that enjoy love, laughter, and stories that bring you to the past.